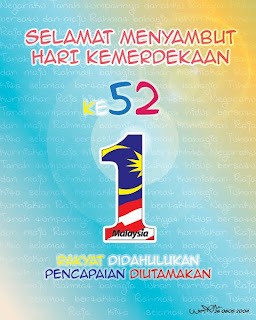 Selamat Hari Kemerdekaan Yg ke-52,Malaysia!Merdeka! Salam and Hello to all of my friends/ my blogging buddies/ my blog readers..Please welcome to my new 'castle'!Dear friends.. FYI There's a lots of problems with the old Blog.. Got errors here and there..I can't find a solution to solve the problems..So I decided to create a new Blog with new url.. I will imported the link of my blogging friends from my old Blog into this Blog.. but sadly i can't import my followers here.. and the posting too.. sob..sob..I hope, I can still get 'connected' with my blogging friends from my old blog, here..